When Mark and I returned to Newburyport, MA from our “little” road trip to North Carolina, we had less than two weeks to get ourselves and all our luggage ready and prepared for our trip back to Tahiti. And to relax a little bit after the intense “cancer” months and before settling into the boat life again. 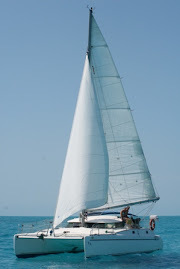 We shopped some more online and in stores, we watched the fireworks concluding Yankee Homecoming, we helped Mark’s brother Tim move his boat Silhouette downriver, and a week later we went for a great sail on her with Tim’s family. Both times, Mark and I were very happy to be on the water again – we felt Irie’s call! There was a farewell family dinner at Carol and Stan’s place, we spent more time with the adorable twins Cera and Lily, and, unfortunately, we had to say “goodbye” to dog Oliver, who suffered from a rare cancer. He was only five years old and will be missed! Mark’s mom Carol treated me to my first pedicure, which was an interesting, but relaxing experience and another family reunion consisted of meeting up with Mark’s niece Chelsea in the cute inn and restaurant “Publick House”, a two hour drive away. We also saw our friends Lisa and Scott again for a fun evening in Amesbury. In between, we took advantage of the reliable internet service and the hot, pressurized showers, before we would be without. On our last day in the States, we managed to fill four bags as checked luggage and three pieces of carry-ons! And then, it was time for the long flights back to Tahiti and to come home to Irie! Days of hot weather and then all of a sudden... yes, that is hail! Lily and Cera with the pearls we brought them from the Gambier Islands in the Pacific - although they are more interested in a pretzel as of now! Silhouette under sail - it felt great to be on the water again! Mark, captain of boats and oceans! And finishing off the night with a yummy dessert, while I still could!